These medieval fake coins were struck in the Moldavian mint of Suceava and are present on Romanian coins thanks to Mr Adrian Popovici. The coins correspond to quotes 892 and 991 in Monede şi bancnote româneşti. Inside the Suceava mint (called bănărie), reestablished under prince Eustratie Dabija, the issues started in 1662 and went on up to about 1680. During this period only Moldavian copper shillings were struck, commonly named şalăi by the general folk and solidi in Latin and forgeries of several European currencies. Numerous imitations of Swedish, Polish and Prussian shillings were counterfeited there under the reign of Eustratie Dabija as well as under the rules of his followers, Gheorghe Duca and Iliaş Alexandru. It seems that the forging activity is linked to the name of Titus Livius Boratini, concessionary of the Cracowian mint. 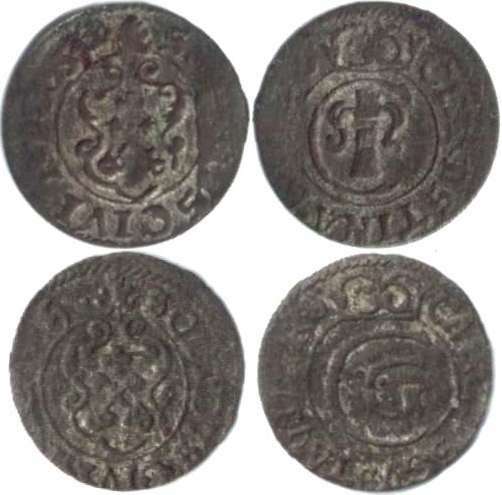 The counterfeit mintage of Swedish shillings show that these were quite well spread in Moldavia. Maybe the Swedish coins flushed on the European market along with the Tirty Years' War. Best represented in Moldavian forgery are the Christina Swedish shillings, knowing over one hundred variants. The fakes bear the coat of arms of the Latvian city of Riga, "the famous fortress on land and see", as called by Moldavian chronicler Ion Neculce. At the time the town was under Swedish rule, seized from the Poles. Around 1710 the fortress was captured by the Russians.